The name of this dessert is slightly amusing, and is not really clear as to why it is named a grunt. It also doesn’t make an appearance on most West coast dessert menus or dinner tables, but it’s a top dessert contender in our house. It is typically seen on the East coast and is similar to a cobbler, but just different enough. Usually cooked stove top, and super friendly camping dessert, I took a different approach to this one and baked it in the oven to get the biscuits that top this dessert a brown crispy delicious texture. A grunt has a sweet biscuit placed on top of the fruit and cooked stove top, or in this case, in the oven. A cobbler is a deep dish fruit dessert with a pastry dough type topping that covers the whole deep dish top. I am sure you have eaten many cobblers, as have I. So I dare you to give this a try, and let me know what you think! So you’ve heard me say my favorite this, my favorite that, but now I tell you this is my favorite. What a hypocrite! But I decided for reals this time. 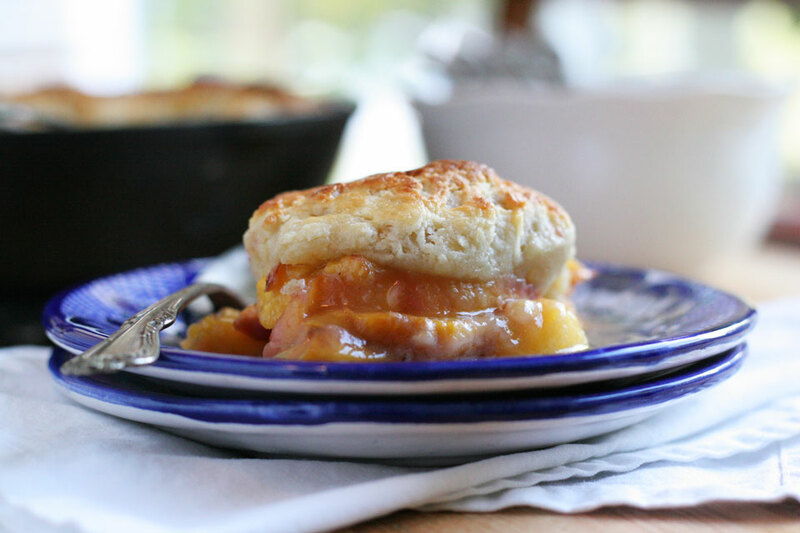 Peaches are my favorite cooked/baked fruit. I can’t say any of my other “favorites” will stay the same, but this will. I have decided. The texture and smell of a fresh peach when you walk by them in the markets is intoxicating. It is sweet, ripe, and I can smell them from a mile away. 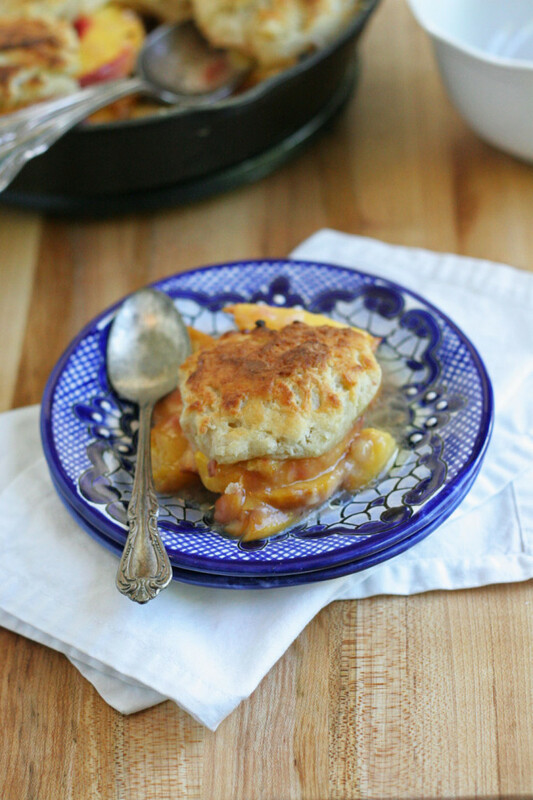 Peaches baked in a pie, galette, or grunt has an alluring smell like no other. Fresh is amazing, baked is pure sweet heaven. And like any other cooked/baked fruit, I suggest to taste the fruit for sweetness and adjust the amount sugar needed. 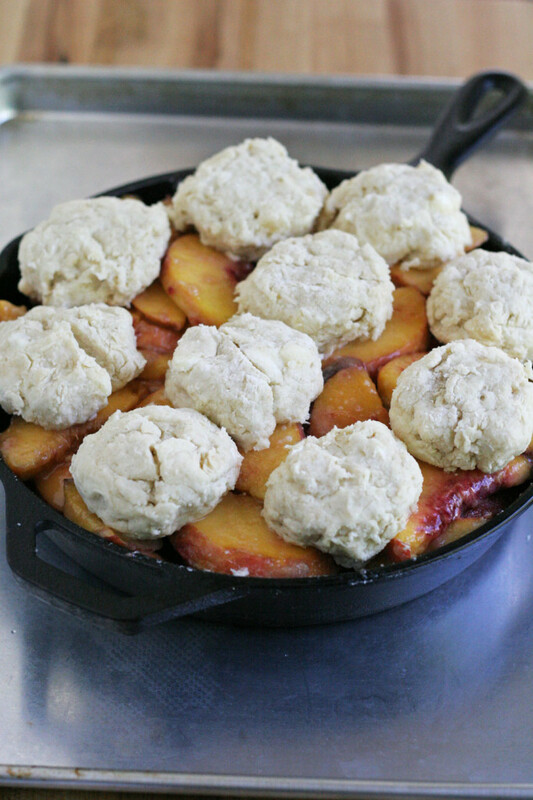 I will so be taking this peach grunt prepared in a cast iron skillet to cook atop a beautiful campfire later this month on our camping trip, also much needed. I haven’t been camping this season yet, and I cannot wait to turn off my cell phone, and computer to read and eat in nature. Breathe fresh air into my lungs! More happy thoughts…I am excited to have shared this dessert on KATU AM Northwest! Have you had a peach grunt? Note: I used a 10 inch cast iron skillet. You could use a 10 inch pyrex, cake pan, pie tin, or oven safe dish. Just make sure it is a 10 inch pan. A ceramic pan could be so pretty! 1. 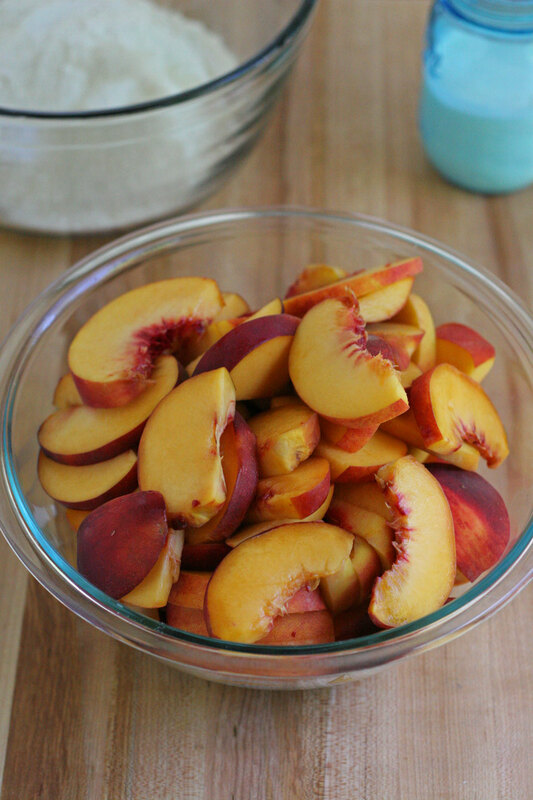 Place the peach slices, sugar, and salt in a large bowl, gently combine using your hands or a rubber spatula. Place fruit mixture in baking pan. 2. Place flour, sugar, and salt in a large bowl, whisk to combine. Add cold butter cubes. Using your fingers, a fork, or pastry cutter, rub the butter into the flour until small peas sized chunks are formed (I use my fingers always). Add the buttermilk and bring together using a fork until dough holds together. Do not over mix, it is ok to see bits of flour. 3. Divide the dough into 12 biscuits in one of two ways. Place dough on counter and bring together to form a circle. 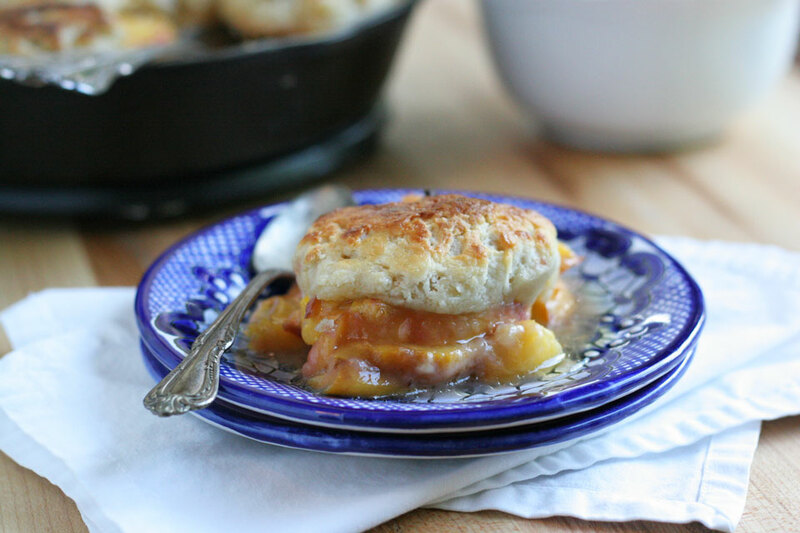 Use a 2 1/2 inch biscuit cutter to make 12 biscuits. Or scoop about 1/3 cup size piece of dough from the bowl. Place biscuits on top of the fruit. Place pan on top of a baking sheet and place in the oven for 25-30 minutes, or until the biscuits are golden brown. 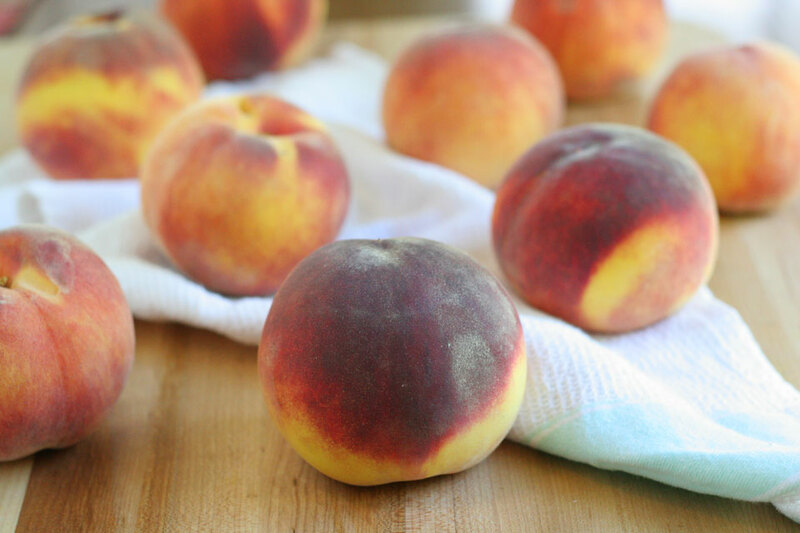 Remove peach grunt from the oven and allow to cool for 30 minutes. Best served same day, not recommended for leftovers. The bottom of the biscuits get soggy. You can, however, prep the entire dessert, keep the fruit and biscuits separate and in the fridge for up to one day in advance. Put together once ready to bake. Stove top method: Prep the fruit, place in a stove top safe pan, like a cast iron pan. Place pan on stove over medium heat and cook fruit for 10 minutes, stir occasionally. Place biscuits on top of fruit, cover with a tight fitting lid, and cook for 20 minutes. Allow to cool 30 minutes before serving. I saw your recipe on the local news this morning and thought I’d give it a try. I love cobblers and cast iron cooking, so this was perfect. I’m finished and after much deliberation, we’ve determined that the biscuits are too gluey and taste too flourly. Otherwise, it’s fun to make and would be good while camping.